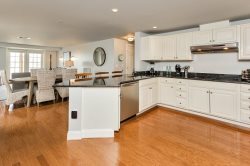 Enjoy living in seaside Portland, Maine in a brand-new luxury townhouse. Situated on the western slope of Portland's Munjoy Hill, this beautiful, light-filled contemporary residence offers expansive views of Back Cove and Mount Washington. The private garage, private elevator, and large rooftop deck allow for sophisticated urban living in the utmost of comfort and convenience. This gorgeous townhouse has sleek contemporary finishes including stone counters and hardwood floors. It is furnished with new contemporary sofas and seating and a stunning 1960's Danish dining set. The view from the rooftop deck is spectacular, and the Portland skyline twinkles at night from the west-facing windows. The eco-friendly, energy-efficient, progressive townhouse community is built around a "woonerf" -- a Dutch landscape design concept which incorporates shared pedestrian and vehicle access. Munjoy Heights is directly connected to Portland's extensive walking/running/biking trail system, including a beautiful 5-mile oceanside loop. In fact, from Munjoy Hill you can walk or bike to the beach, numerous parks, and almost everywhere in Portland! The nearby Old Port is known for its cobblestone streets, small boutiques in beautifully refinished brick buildings, the docks where fishing boats still come back home after a day of fishing, and more restaurants per capita than any other city. Portland is a foodie's paradise. The Downtown Arts District is home to galleries, theatre, the symphony, the Maine College of Art, and the renowned Portland Museum of Art. Each month, the First Friday Art Walk draws hundreds of culture-loving Portlanders. On Wednesdays and Saturdays, Portland hosts one of the top-rated Farmers' markets in the country. In your backyard is Casco Bay, with opportunities for kayaking, sailing, and exploring the islands on the convenient Casco Bay Lines.